Until last month, this was our 24 year-old master bathroom (minus the decorations and 47 shampoo bottles). Sad trombone says ‘wah wahhhhhh’ and I agree. Here’s what was bugging us about our old shower/tub area. Where to start? Old carpet (Q: Who carpets a bathroom? A: Everyone in 1989.) A huge 2-person garden tub that was rarely used except when the grandbabies swam in it. They’ll be the only ones to miss it. 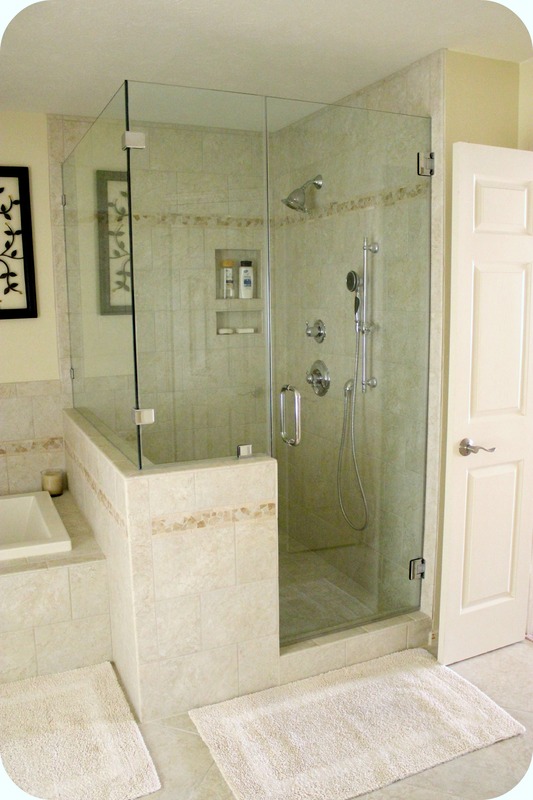 Shower tile, some of which literally comes out of place every few years, a shower door so low The Complete Package has a history of banging his head on it, and glass so short water from every shower flies out and sprays the entire bathroom. Ugh. What are you gonna do? That’s right… rip it out, baby! Boom. Gone! We found a contractor we enjoyed working with, agreed on every single decision (a rarity), dug in, and got it done right on schedule. Seriously, everything went like clockwork. 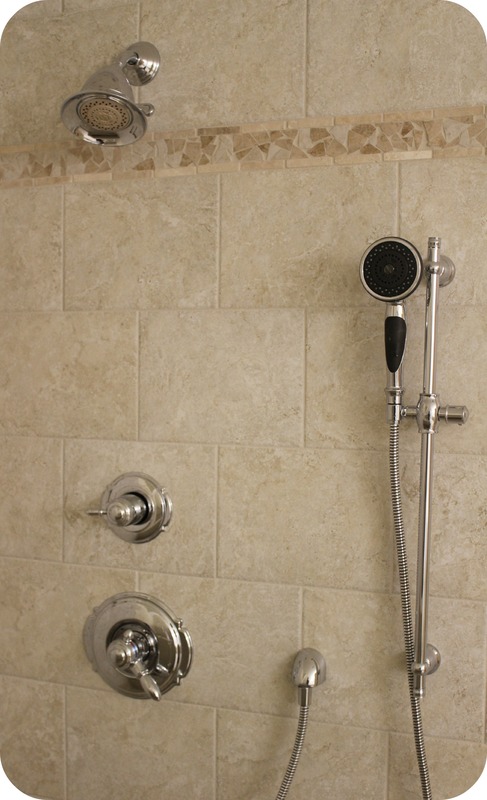 The only minor hiccup was a corroded pipe behind the old shower tile, which was quickly replaced. 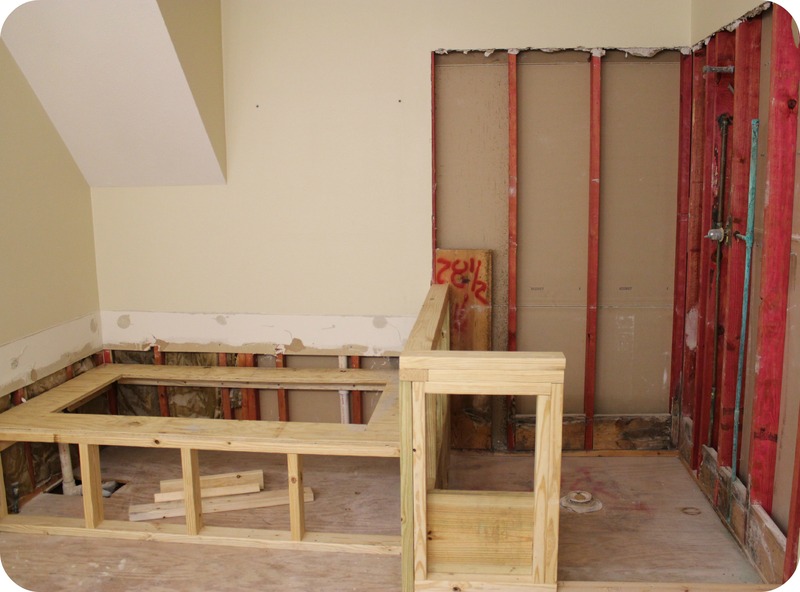 Next up – plumbing rough-in for the new fixtures and a new concrete base for the shower floor. 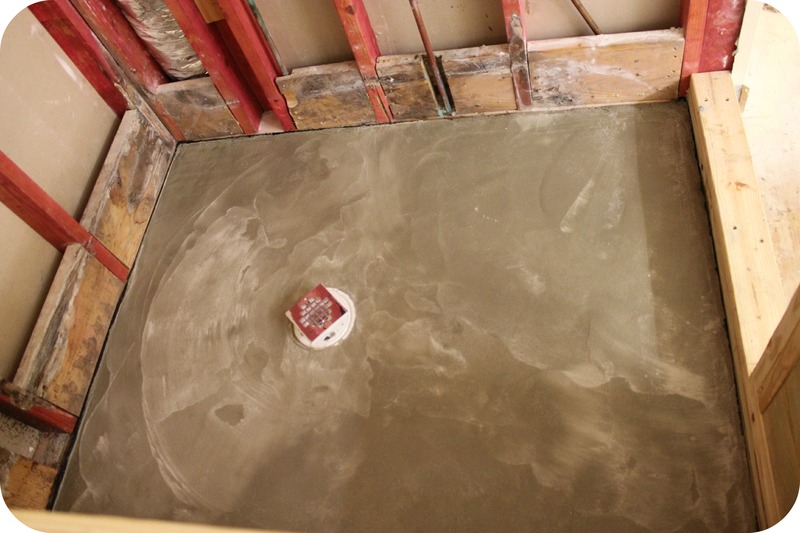 For the record, our old shower did not have a concrete base but should have. It also didn’t have a vapor barrier or waterproof backer board. The things you learn when tile is ripped out, man. We’re lucky we didn’t suffer a serious leak over the past 24 years. It’s kind of a miracle. This time around, we had a contractor that knew how to do it right and the difference between old and new is like night and day. We’re completely thrilled with the new stuff. One last look at the before photos before I start revealing. First up, the new soaking tub. It’s smaller, deeper and rectangular versus oval. All I know is that I love this tub. When you want to soak, the water actually comes above your shoulders. As it should. Also cool – the front tile panel is held on with magnets, so if you ever need to access the plumbing, you don’t have to wreck the tile work. Genius! And that decorative border? It’s in the shower, too. But before I show you the shower, here’s the new floor tile. 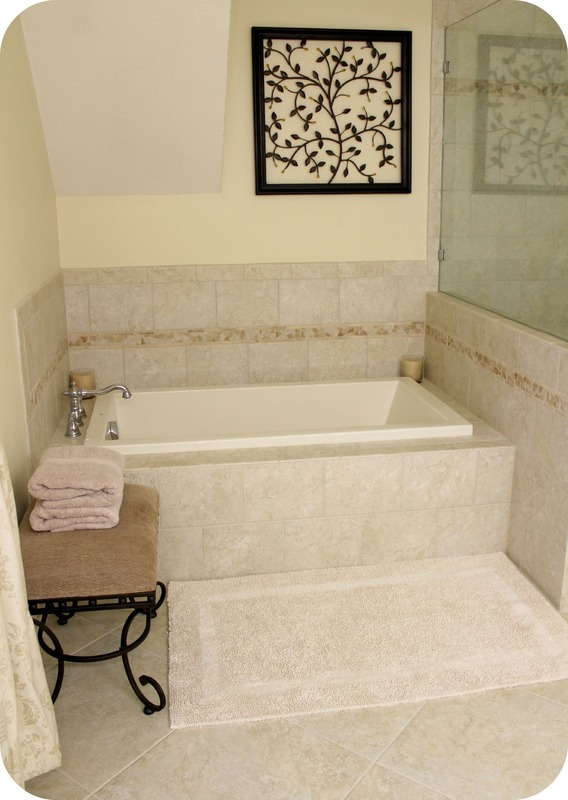 It’s the same tile used for the tub and shower, but in much larger 18″ squares. I love it. Goodbye nasty old carpet. Hello clean shiny tile! Other than the decorative band, we used the same tile throughout the entire bathroom in different sizes. This same floor tile is in the shower floor in a 3″ x 3″ version. Wanna see? Do you want to see it now? Okay… here you go. How do I love my new shower? Let me count the ways. I love the larger size – at least a foot deeper and about 18″ wider. I love the taller frameless glass. I love that the tile goes all the way to the ceiling. And I love the new fixtures. No more bending over to shave my legs, or throwing a leg up and hoping I won’t slip and fall. (Don’t try to picture that last part, just move along.) It’s at least 4 feet long and 12″ wide, and we were able to hand pick our piece of granite, which includes some really cool streaks of gemstones. I could not be happier. 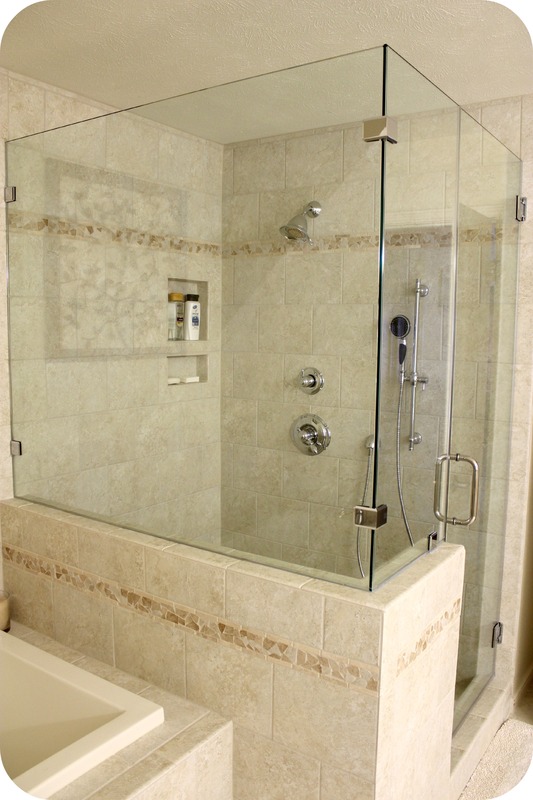 An unexpected bonus – because the new shower glass is much taller, it holds in the steam thereby turning the new shower into a steam shower. That’s going to be lovely this winter when our Houston temps dip to 45-ish. I joke, but it really is nice when the bathroom is chilly. Except that you want to stay in the shower and not come out. Like ever. Do they make wine racks for showers? Have I said how much we love our new bathroom? Because we really, really do. So we moved into the guest bedroom and bathroom for 4 weeks. Who cares? So we had to move our clothes and all of TCP’s computer equipment (since he works from home). Done! 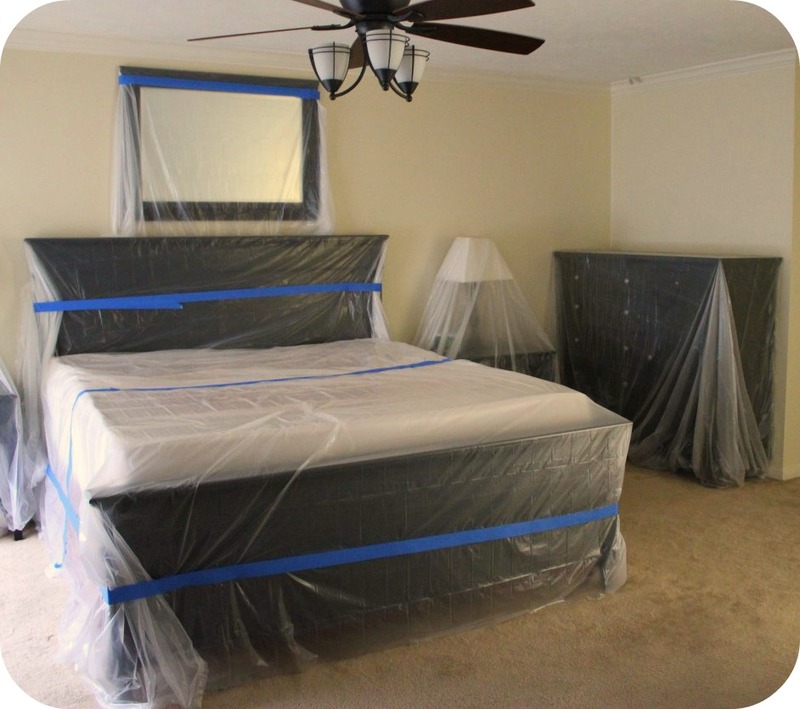 So we had to wrap our entire bedroom, study and both closets in plastic sheeting to protect it from construction dust. No big deal! No peppermint soap dispenser? I have shower envy! Congrats on the remodel. Ha! You know me well, baby sister. That looks amazing! Congrats! We too had carpet in our bathrooms -ewwww! Who’s bright idea was that and why on earth was that a trend!? We replaced the carpet but definitely wanted to replace tub/shower. Our house is being rented now, but I may get the contact info of the contractor you used when it’s time to rip that sucker out of there. Someday…. Hopefully sooner rather than later! I love the new bathroom! I’ve never heard of carpet in a bathroom before. That seems like a recipe for disaster. Maybe it’s a southern thing or a Texas thing or a southern Texas thing, but all of our bathrooms were carpeted when our house was built. It makes ZERO sense to me, but that’s what they did back then. The master was the last to get new tile, and I can’t say enough how much I love it. SO much easier to clean! I’m sooooo jealous!! Does you contractor do work in N. Texas???? It turned out great!! Enjoy!! Thanks, Sis! We’re enjoying the heck out of it! Feel free to come down and try it out. I said it once and I’ll say it again, that bathroom is gorgeous! I love everything about it. Our landlord needs to rip out our entire bathroom too, but I don’t think that’ll happen any time soon. You are one lucky lady! Enjoy a good soak! Side note, I do like Dexter – lol. Okay, about this BEAUTIFUL bathroom. I LOVE it!. It has such a nice peaceful spa feeling to it. It looks like it belongs in Better Homes & Gardens. 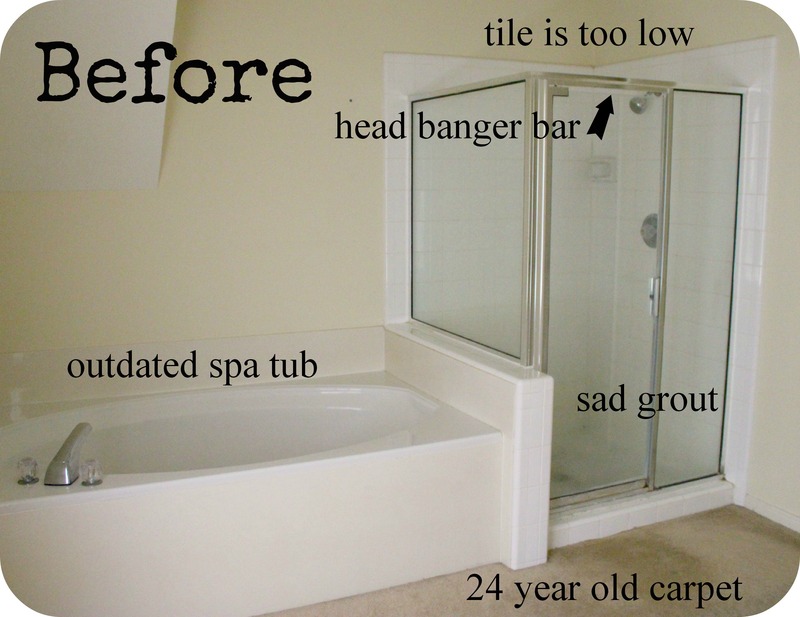 Amy from Ms. Toody Goo Shoes is looking for advise on a master bath redo. Maybe you better stop over and help her out. You done good! Gasp! That’s amazing. Love all of it! Jeanne, this is a superb reno—congrats on the updates and getting it done on time. 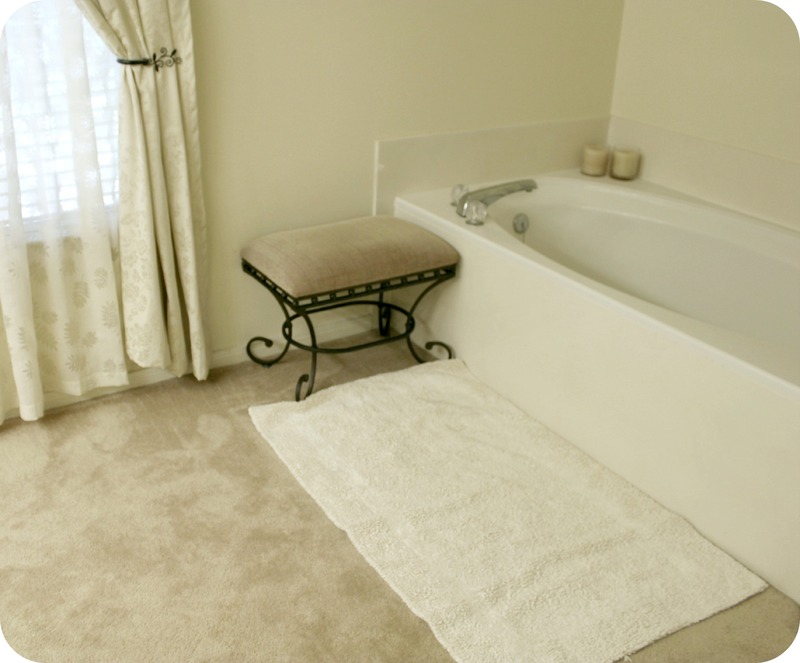 I never understood carpet in a bath either, fad or not, and unfortunately it was a hit in CA too. This Dexter fan says cleaning up after a serial venture should be a snap as long as the new tile and grout were properly sealed! ;) The bigger question is: only 47 shampoo bottles? Clean-up was a snap since we covered everything in plastic. I also made it my personal mission to vacuum and dust every other day to keep up with the dust that got pulled through the air vents (which were promptly replaced as soon as the last grout bag went into the trash). Overall, I’d rate our experience a solid 10, which blows my mind. I expected SO much drama, but there was none. Amazing. PPS – That 47 + soaps & other products + 2 boxes of product under my sink. I had a lot of purging to do. Coincidence! I just picked up Mapei grout for the kitchen backsplash. Great minds think alike. I’m going with extra sealer too. Grout and I aren’t compatible unless said grout cleans easily. I can’t wait to see your ‘after’ photos, Brooks. That is absolutely lovely! You have given me lots of inspiration for our next remodel! Thanks, Kris! If you remodel yours soon, you’ll have to share with us! It’s gorgeous! I just wrote a post on my master bath dilemma, and if I were to start from scratch, I would do mine in the exact colors you chose. Enjoy it! 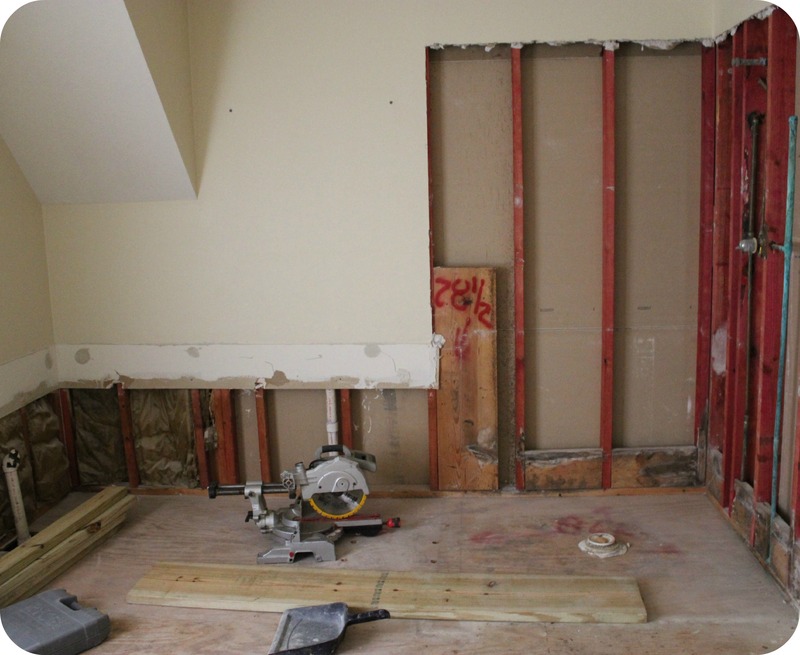 Remodeling is always such a huge undertaking, especially when you are working with an older home. You never know what you will find when you take down a wall or rip up a floor! Do you have any idea how amazing it is that your project went on schedule?!? Ours have always taken twice as long as originally expected. Your new bathroom is beautiful! I love the trim in the tile! On a much brighter note: I love the new bathroom. Great color scheme and that bench is a real treasure. Very much worth the Christo-effort of wrapping up the rest of your house! I still await the day when you decide to come see it for yourself. PS – your carpet story made me giggle & gag a little. PPS – which reminded me of our herring adventure. PPPS – and now I’m missing you even more. I was excited to find a non-food post–surely, I though, this one won’t make we drool worse than my teething daughter? No such luck! 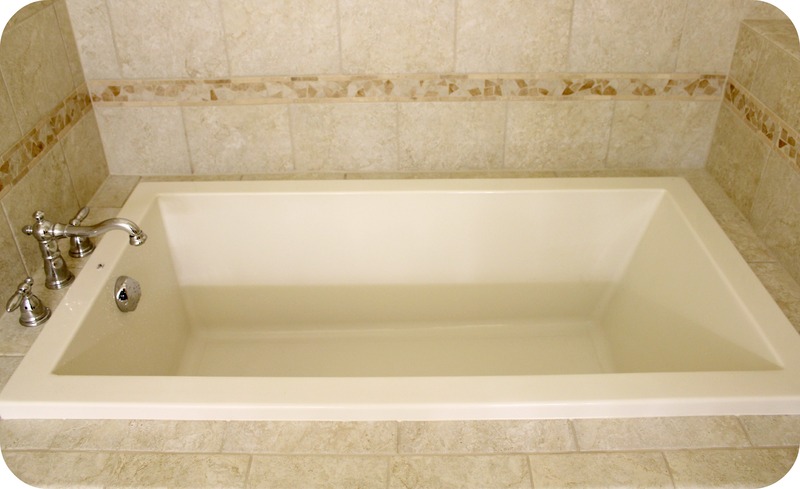 Can you give more info on the tub? 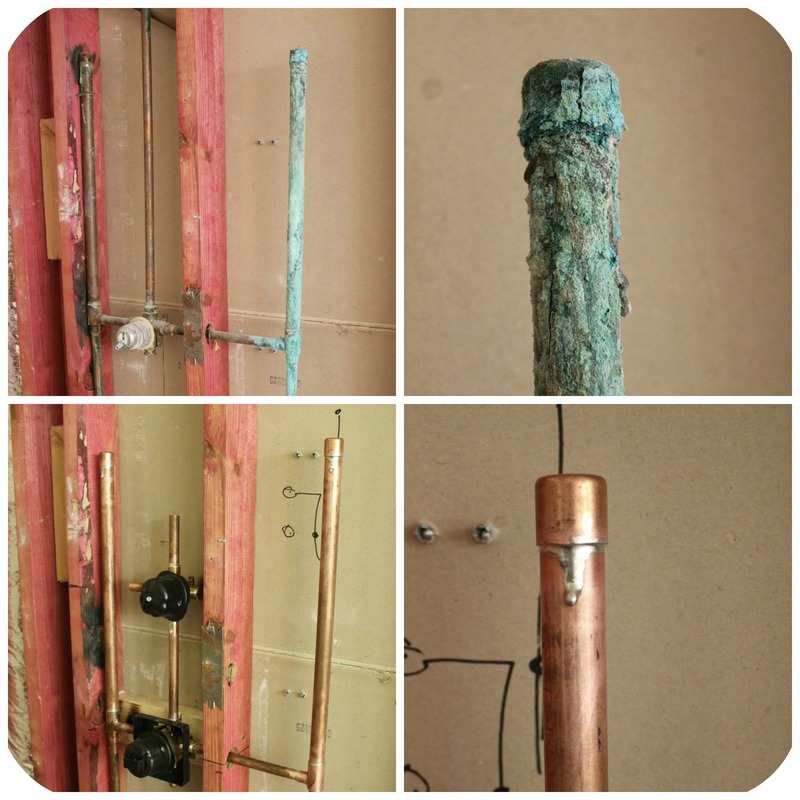 Brand, size, what it’s made of…We are about to do a master bath make-over too. And I love this! 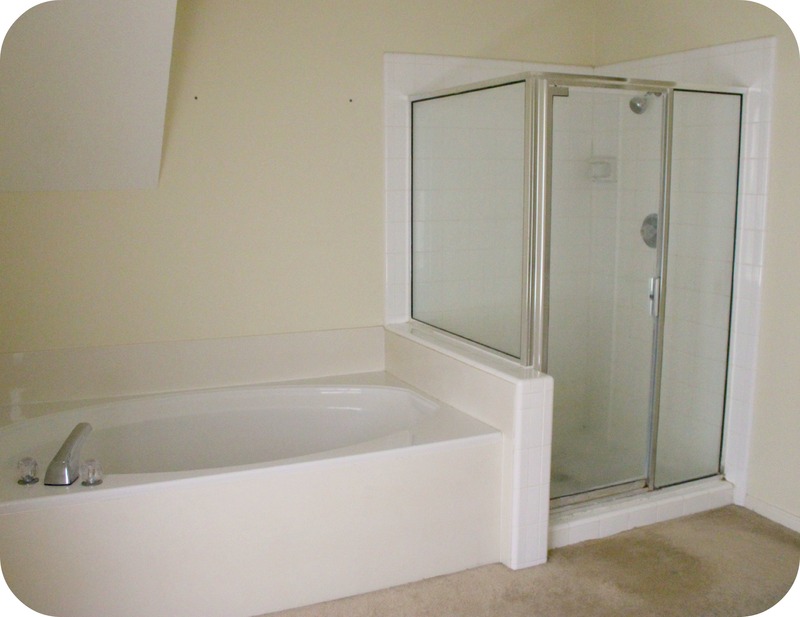 The layout of the your tub & shower is just like ours. 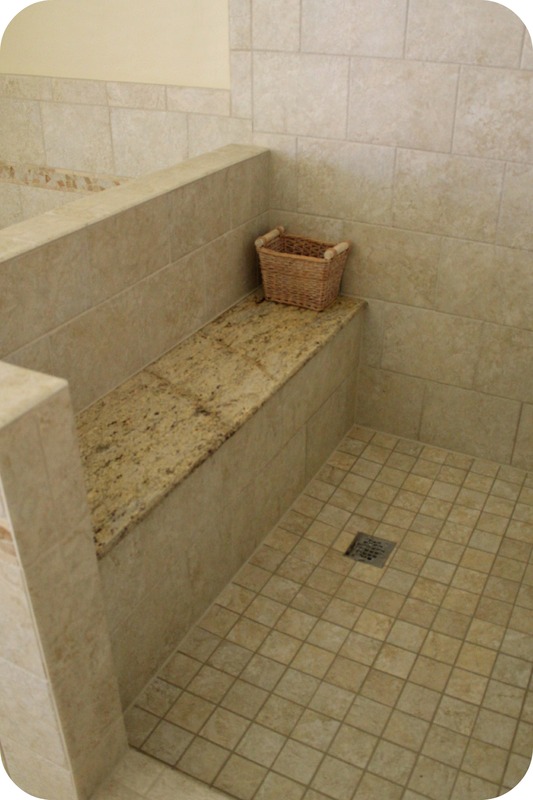 I just cannot find the tub – I want a soaker tub as you are describing. Thanks for your help! Tub: Emerald Diamond Series drop-in soaking tub. We paid $536 for the tub alone, which was the contractor price, not retail. That price also did not include the faucet & fixtures (drain kit, etc.). It can be ordered in different configurations, depending on where you want the faucet. The one we bought was Model GL3260SPBS, which is the 32″ x 60″ tub w/out whirlpool jets. The color we choses is bisque (ivory). Can you tell me the name of the tile used in this project; thanks. 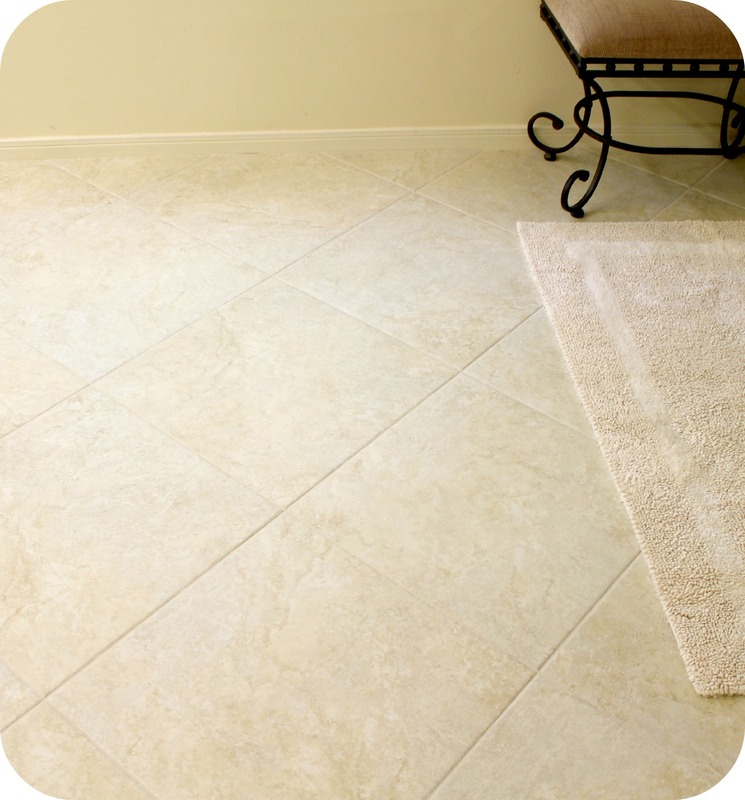 The main tile is Mohawk Delanova (AD15065) in Chiara Cream. 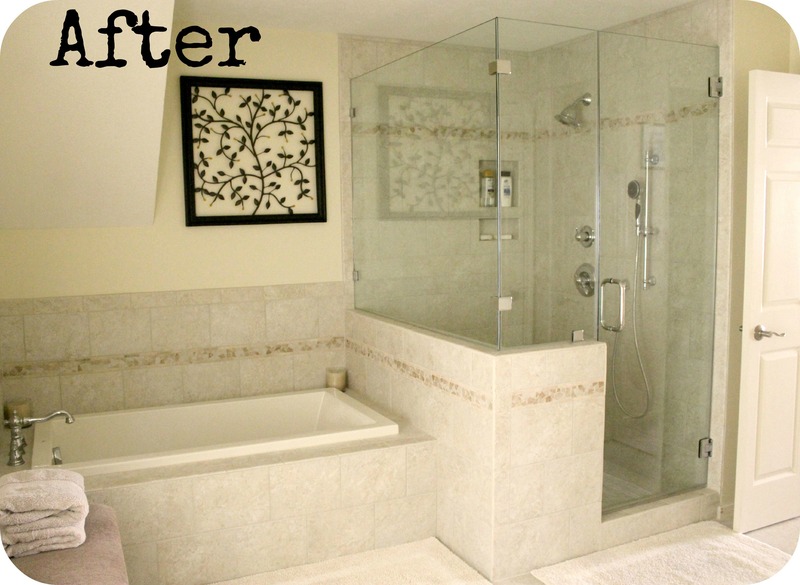 We used 20″x20″ for the floor & 9″x12″ for the shower/tub. The decorative trim is Mohawk Risalto (AD5129) 3″x12″. Grout = Mapei UltraColor Plus w/Polymer in #14 Biscuit. Can I please have your contractor’s number? Love it!! I have a similarly situated outdated jacuzzi and shower, I never would have thought to extend the shower out to make it deeper duh! I was struggling with whether or not I’d have enough room to make it wider but because I have a window above the tub this wouldn’t be possible. Looks great! Looks so good and thanks for the great design ideas! I want to tackle the same layout in all of its gold shower framed and cultured marble glory. Hello! I absolutely love your bathroom makeover. Can you tell me the dimensions? Thank you! I’m so glad you liked the bathroom renovation. We enjoyed those upgrades immensely. We moved to Austin a year after that remodel, however, so I no longer have access to get those dimensions for you. Good luck with your project. Thank you Jeanne! I appreciate your reply. Beautifully done! Enjoy your new home.